Hope everyone had a spectacular holiday. Glad to have you back. Now on to New Years! But, for today, some inspiring spaces to peruse. Really loving this entire room. That artwork is just beyond! And the chandelier, the same. 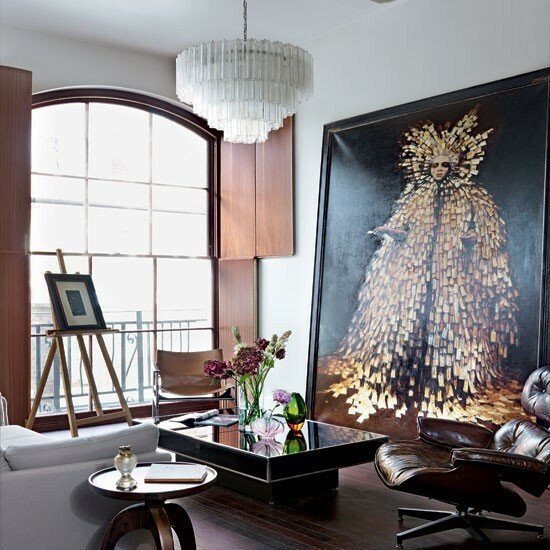 Then to bring it down a bit from the over the top glam, we have a classic, worn Eames chair. Well done! Love the whole feel of this room. 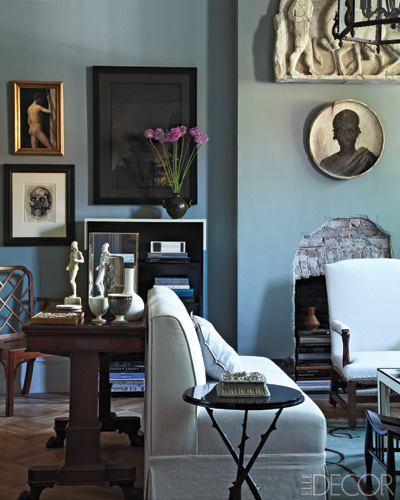 Specifically the chalky blue of the walls, and the fantastic artwork. Digging the massive art piece to the left there, along with the whole console/bookshelf vignette. One thing I noticed after putting these pics together is that artwork plays a large role in the success of each room. It's amazing what the right pieces can do to make spaces special. I love massive art. It is always so striking and such a feature. That first room is stunning! Love the colors too..